on alcohol this long weekend if you are quitting smoking. Drinking early in your quit can kill it - pure and simple. but I'm not drinking over it because drinking kills brain cells and I have 3 left. I would most likely smoke if I lost one more. So right Nancy ! You must be careful even going to a party I lost a quit one time when i was ut having fun i wasn't even drinking but the "party spirit " and so many around me smoking got to me and i had 3 months quit at the time ! Thanks so much for sharing this. Important information to remind us ALL to remain vigilant! And, perhaps, doing STUPIDER things like tying a cow to a scooter for the purpose of taking a photo of it!!!! Now this I am not surprised, been to India and everything from a family of 6 to tires, cabinets, car windshields, you name it, everything can go on a motorbike, and they love their cows. They are sacred, and are brought in beautiful, expensively decorated homes to bless it, and bless the family who's going to move in. Our quits must be our # 1 priority,thanks Nancy, I know that I lost a couple of very good quits way back when by having one two many drinks, once was a three wk quit but the other quit was over 3 months and I thought I was safe but boy was I wrong and it took me 20 yrs to get it right! Interesting. 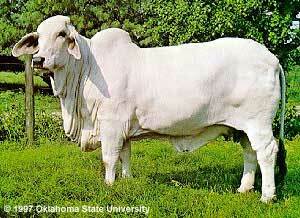 The Brahman cattle I grew up with in Jamaica looked more like this with more of a - I guess what I'd call a dowagers hump. Which I am trying to prevent for myself! The pic I posted was a baby. The humps seem to grow as they do. I just love their coloring, ears and eyes! Ah. Never thought of that! So they grow their humps - of course, like us dowagers do! Their ears ARE gorgeous! You grew up in JAMAICA???????????????? Somewhat. Went to school there for a while in the 3rd? grade, I think. That's a great reminder, Nancy! I don't drink much at all. Mom bought some red wine and we drink it very rarely, maybe a tiny glass of it with dinner once a month. Maybe. I like all the pictures in your post, with the replies! They are so cool and funny. jonescarp.aka.dale.Jan_2007 posted some good lookin' macaroni!